There are so many great golf apparel companies which make some fantastic threads. Here are a few quick gift suggestions for the golfer on your Christmas list. Each short description includes a link to the original Hooked On Golf Blog review. Tattoo Golf’s Clubhouse Collection Polo is a very comfortable and sharp looking golf polo. The fabric, 100% woven polyester, is high on comfort and low on management. The fabric resists wrinkling and doesn’t need to be ironed if you take it right out of the dryer. Not only is the polo very comfortable and high performance, it is adorned with the timeless signature Tattoo Golf skull and cross club bones. Staying warm on the golf course is imperative for comfort and playing well in cold conditions. If I’m not warm, my back tightens up and the swing goes bad. Very bad. The Dunning Golf base layer is a system you wear under your normal golf threads. The base layer system can include a long or short sleeve merino wool undershirt as well as merino wool boxer-briefs. My personal experience with the Dunning base layers has been nothing short of fantastic, on and off the course. If you were to give this $280 jacket as a gift, you’d be telling someone they’re very special. This is the same jacket the likes of Rory McIlory and Tiger Woods had in the bag at the 2013 British Open. 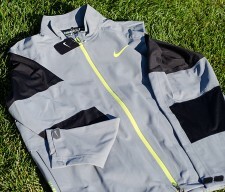 The Nike Hyperadapt Storm-FIT Jacket is an amazing performance golf jacket which a very stylish design. Most importantly, this jacket can hold off even the worst of Scottish rain and wind. 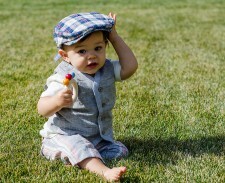 Got a baby or youngster who could use some very classy golf apparel? Back on October 21, 2013 I posted a review of some of the products from FORE!! Axel & Hudson, makers of very stylish and classy golf apparel items for ages 12 months to 12 years. Included in the review: Crinkle Plaid Driver Cap, Poncho Stripe Shorts, two Golf Polos. 2013 marked the year that the very cool company OGIO started to offer golf apparel to go along with their killer golf bags and accessories. I’m thrilled with the comfort and style of my OGIO Groove golf shorts. These are made from 94% polyester and 6% spandex. The end result is mega-comfort, no wrinkles and easy care. Here’s one you may find in your local apparel store or golf shop, the Greg Norman ML75 golf polo. 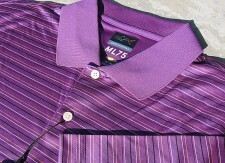 The ML75 is a very sharp looking polo which comes in some really great color combinations. The polo is made from a super fine microfiber polyester yarn which is so soft and smooth that the shirt feels like it is made from silk. I’ve raved about Switch Belts many times. These are so cool. Switch Belts are made from plastic. They come in one size and the wearer cuts them down for a tailored fit. There are 14 colors available in both the belt and buckles, which are interchangeable. That makes 196 different color combinations. Better budget some extra time for getting dressed in the morning. Since the belts are made from plastic, they can be washed in the dishwasher. Yes, the dishwasher. Thanks for the gift guide! I’ll be getting some new clothes for my golf buddies for X’mas. Cool. Thanks for the comments.